Between driving stick, fixing old trucks, and scaring the hell out of sexist monarchs, the Queen's gearhead cred is firmly established. But Elizabeth II can't always be bothered to drive, so now's your chance to get up on all that sweet, juicy Royal gossip. Queen Elizabeth II Can Drive Stick And Fix Old Trucks, Can You? As chauffeur you will work as part of a busy and supportive team tasked with driving members of the Royal Family, Household officials, guests and official visitors. You will ensure the vehicles are well maintained and kept to a high standard of presentation, whilst assisting with the daily administration and management of the Royal Mews Garage. With the opportunity to develop your skills, you will play an integral part in the smooth daily running of the Royal Household. It's a 48-hour, five-day week gig and pays £24,000 (around $37k) a year, which obviously isn't much, but it notes that this is a live-in position that includes room and meals. Also, you're driving for the damn Queen, which isn't something you find on many resumes. Naturally, the job is limited to U.K. residents and that makes for a once-in-a-lifetime opportunity. 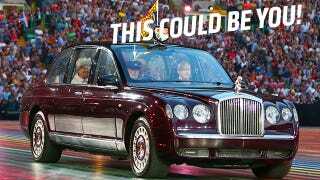 So in the fine tradition of pioneering British reality TV, here's a proposal: Who Wants To Be The Queen's Next Chauffeur? Just imagine the challenges. Simon Cowell, get at me.